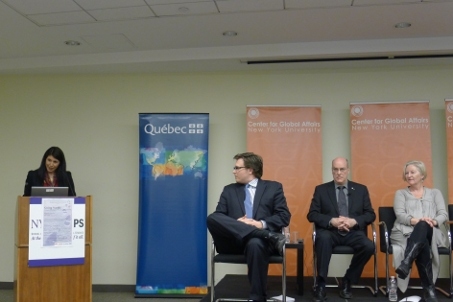 On Wednesday evening, NYU’s Center for Global Affairs and the Quebec Government Office in New York City cohosted a panel on economic development and sustainable livelihoods in the Arctic. The three panelists brought perspectives from the hard sciences, political science, and the Inuit to the discussion. Dr. Louis Fortier, Erica Dingman, and Udloriak Hanson each spoke for ten minutes and then answered questions from the moderator, the Economist’s Robert Lane Greene, and the audience. Alain Olivier, Director of Communications of the Quebec Government Office in NY, started off the panel by talking about why the North matters. While what often first springs to mind is oil and gas, or shipping, he stated that the Arctic “regulates the oceans” and that “people live there.” This panel’s goal was to shed light on the very issues of environmental sustainability and social issues in the Arctic, whereas the first panel very much focused on the geopolitics of resource development, specifically hydrocarbons, without paying as much to the consequences on the organisms that make the Arctic their home, whether the Inuit, bowhead whales, or microplankton. Olivier mentioned that Quebec will soon be issuing the Plan Nord, a development strategy for all of Quebec that lies north of the 49th parallel. While the plan will rely heavily on mining, forestry, hydroelectric power generation, and tourism to stimulate the economy, the ultimate goal is to protect 50% of the land from any development, which Olivier called “an ambitious objective.” The provincial government has worked with several native communities in the hopes of getting development right this time so that it benefits all parties involved. The details of the Plan Nord will be released soon, and I plan to write a more comprehensive post about it. Olivier concluded by saying that the Arctic offers an “opportunity for interdisciplinary research at the academic level,” a fitting ending to his speech that opened up the floor for a very interdisciplinary discussion. The moderator, Robert Lane Greene, spoke next. He noted that the Arctic is “always in the international section in the Economist,” as the issues there affect so many different states, regions, and peoples. Yet in an odd twist of events, as Charles Ebinger (an American) was unable to make the panel, all of the panelists were Canadians. So while the panel was interdisciplinary, we really only heard perspectives from our northern neighbor. A future panel with participants from Russia, Norway, or Denmark would add a lot to the mix. Next, Dr. Louis Fortier, director of ArcticNet and professor of biology at Université Laval, took the floor. He noted that the Arctic is a “hot topic” because it’s easier to reach and also because ecosystemic and economic changes are occurring. Thus, we have to “combine knowledge of different fields to understand the Arctic” and “bring hemispheric knowledge to the regional level.” ArcticNet, the organization Fortier helped to get off the ground, facilitates cooperation between environmental scientists, biologists, political scientists, and Inuit leaders to name a few. One of the challenges is simply getting everyone to understand each other, since biologists obviously speak a different language than political scientists and indigenous advocates, for instance. Erica Dingman, a research associate at the World Policy Institute in New York City, turned the discussion to the issue of various conceptualizations of sovereignty. Ultimately, in the Arctic, we have to have a view that incorporates the interests of states and non-state actors. The Inuit, for instance, are “citizens of their respective countries, but also a unique group of people.” They have founded the Inuit Circumpolar Council to represent their views at an international level. By contrast, the Arctic-5 seem bent on ensuring state sovereignty in the region. One only needs to look at the Ilulissat Declaration, which in a way rejects the formation of new multilateral organizations to deal with the Arctic. The clash between classic and newly developing types of sovereignty in the Arctic are occurring because not only are indigenous peoples and states stakeholders, but so are NGOs, corporations, and non-Arctic states. Dingman believes that climate change will be the “game-changer in the 21st century,” and it is certainly changing the rules of the great game in the Arctic, if there is one. After Dingman finished, Udloriak Hanson, born and raised in Nunavut, took to the podium. She observed how crazy it is that only 55,000 people live in all of Northern Canada – approximately as many as fit on a city block in New York, give or take a few! (Manhattan has a density of 72,201 people per square mile.) Still, despite this tiny population, Hanson said that the Inuit have been “very successful in getting their act together,” forming community, regional, national, and international organizations. She outlined her argument on why the Inuit should attach conditions on resource development along three lines. Why do the Inuit need to attach conditions to development? Why does the world need to pay attention? While all of the self-government agreements and new territorial agreements “do not add up to unconditional control of our region,” they do form a “tripwire that will make it difficult for outside companies to invest” without active Inuit partnerships in many areas. Companies and corporations need to respect the Inuit’s legal rights to resource development in the Arctic. What outcomes could a balancing of Inuit and state interests deliver? To the Inuit, the Arctic is Arctic “home, sweet home.” They inhabit the region, so their sustainability and well-being is “central.” Sustainability is already at risk of disappearing, however. Just a few days ago, Hanson mentioned how she spoke with her mother, who said that they could not go out on the ice as far as they used to. It is melting from below, so it is too thin. Historically, the Inuit were able to be out on the ice until the end of May, sometimes even early June. It is the beginning of April right now.Going forward, though, the Inuit are now full partners who will draw direct benefits from development, rather than just suffering from the negative consequences of it. “The old days of the Inuit being passive observers are dead and buried,” Hanson proclaimed. Yet as a group, they still need to define their interests more clearly. Hanson noted that at the end of February, there was a two-day meeting in Ottawa during which Inuit representatives gathered to discuss the “circumpolar definition of development.” An official document from the ICC will be released in May. After the three panelists gave their opening remarks, Greene asked a few challenging questions. His first was to ask the panelists to unravel the paradox of development in the Arctic for the Inuit. Though many see oil and gas as the way to self-sufficiency (Greenland’s prime minister, for instance, believes oil will make the island an independent state), it also is the main culprit behind climate change. In her answer, Hanson seemed to be a staunch advocate of hydrocarbon development. She observed that depending on who you speak to, some Inuit are for it, and some are against it. Many do not like the idea of more boats, trucks, helicopters, and the general greater risks associated with oil development, which they are already experiencing in Greenland. However, the Inuit “have to figure out a how to become more self-sufficient. Everywhere else in the world, there’s development.” But for some reason, Hanson continued, the rest of the world feels, “Let’s keep the Arctic as a park, a museum.” For this Inuit, this “wouldn’t be smart,” but they are now at the very least well-positioned to say how exactly the development is carried out. Next, Greene asked Dingman about her discussion of sovereignty, during which she said many events there now “defy sovereignty.” However, he rebutted by saying that “the state is not just still relevant, but fundamental.” Decisions in the Arctic cannot be made without states agreeing. Dingman responded by noting that certain organizations are “taking challenges into their hands that states haven’t contended with,” such as the C-40 network of cities around the world which are dealing with climate change on their own. Hansen also responded to Greene’s assertion with a telling example of how non-state actors are gaining more legitimacy in the Arctic. The Inuit recently took Canada to court because the state allowed a German ship to conduct seismic testing in Lancaster Sound without consulting the Inuit. The Inuit won an injunction and watched the ship turn around, back to Germany. This was certainly a victory for a non-state interest won fair and square in the Canadian court system. Audience members then began asking questions. One person asked if the Ecuador plan could work for the Inuit. Ecuador is asking the rest of the world for donations in order for it to not develop its oil and gas resources. Dr. Fortier said that this was impractical as a general concept for other countries and peoples, as the world still relies on fossil fuels for 80% of its energy needs. In the Arctic, the most sought-after hydrocarbon is light crude oil, which generates fewer emissions during its refining process and is also useful for plastics manufacturing. Development of this resource in the Arctic could actually help to displace the highly pollutive tar sands industry of Alberta, making emissions ultimately lower. Hanson also noted that for the Inuit to follow the Ecuador plan, they would require billions of dollars from donors. From the Inuit perspective, this is “just another form of dependency.” “There is no economy in the North,” Hansen declared. 94% of funding comes from the state, and the federal government is the largest employer. To replace all of this with money from donors is an impossible task and would merely transfer dependency. Yet I did have to wonder, in the long-term scheme of things, what happens when the oil runs out? What will the Inuit depend on then for their economy? The topic of the upcoming elections was a fitting way to close the panel on the Arctic, and it is also a topic I hope to discuss in-depth in one of my next posts.